This is what Dakota did to her bed under the blue table this morning. I'm not upset; it's a re-purposed 15-year-old sleeping bag of Michael's. Still, I was confused. 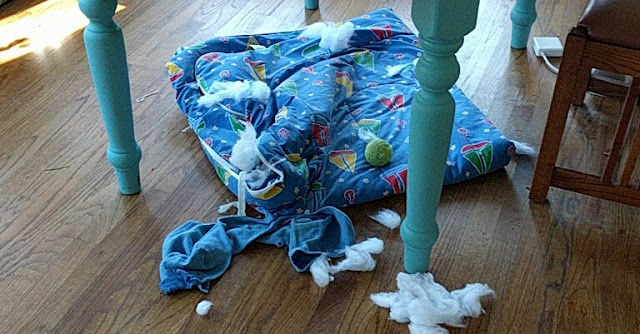 Why would she want to rip up her bed? What's going through her doggie brain today? As I took this picture, suddenly I saw that God might have been wondering the same thing about me as He observed my behavior this past week. It has been a hard shift from Thanksgiving to Advent this week--slammed seems more like it. My heart was so heavy when I traipsed through Target last Sunday, gathering a few things Bob needed for his business trip this week. I could not, did not want to enter in to any of the festiveness, the Christmasy-ness--(yes, it's a word)--that filled my vision every time I turned into another aisle. I couldn't get out of there fast enough. All week my angst about the condition of the world has invaded my private faith experience and dominated my attempts to fully enter into this season. When I saw evidence of Dakota's restlessness and thought, "Why did she do that? I was right there the whole time," I sensed God whispering to me, "I've been here too." I realize that I've been flailing, desperate to see evidence that God is in control in the world so that the weight pressing on my soul would lift, so that I could choose to trust that He is in also in control of my life in all that I cannot see. I believe that Peace can only be found in Emmanuel. I believe that He is with me, just as He was with the people of Israel when they were feeling oppressed and despaired that their Messiah would ever come for them. Just as they did not know how close He was, neither have I. How have the events of this week impacted your ability to engage Advent? Does it help at all to know that God is Emmanuel, that He is in control? I'd love to hear your thoughts. I do not understand why every group we associate with has to have a function at this season. Just be thankful for the coming of Jesus and be more reflective and prayerful. I am not a grinch but our culture is out of control, and it is not healthy.